Kim Boyle has lived a life on two wheels. He started out in BMX, working for GT Bicycles, Airwalk, Vans and DC Shoes—and then got hooked on motorcycles. 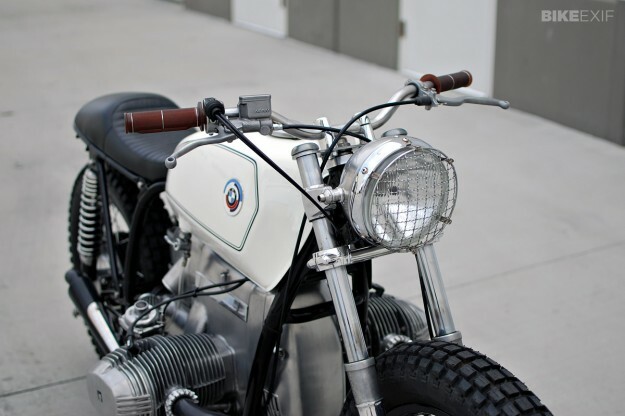 Over the past six years he’s made a name for himself with a series of super-clean builds, ranging from an SR500 wheelie machine to vintage Harleys and a Norton café racer. 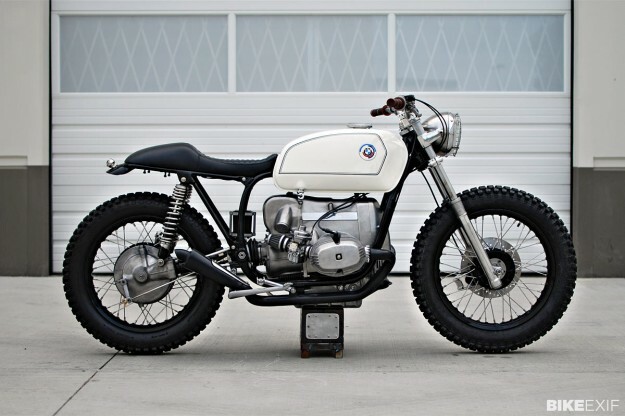 Kim’s latest creation is this sweet 1978 BMW R100/7, which was one of the stars of the recent Handbuilt Motorcycle Show in Texas. Despite being a “zero to no budget project,” it’s a stunning result. Kim started by shaving, polishing and lowering the forks by 4½ inches. Then he rebuilt both wheels, adding black powder coat to the stock rims. 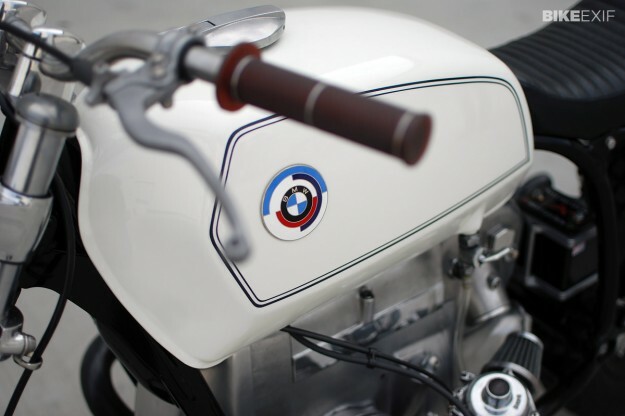 He swapped out the original tank for a sleeker R90 item with a flip-clip gas cap, painted by Shawn Long at Imperial House. “The shocks sat too vertical for my taste, so I moved the top mounts forward a bit and went with half-inch taller Progressive Suspension shocks to get the stance I wanted.” To keep within the budget, Kim welded up a 2-into-1 exhaust using no less than 32 pieces of pipe, with a chunk of heat shield from a Sportster to protect the short muffler. Chrome is expensive, so Kim resorted to black ceramic coating. 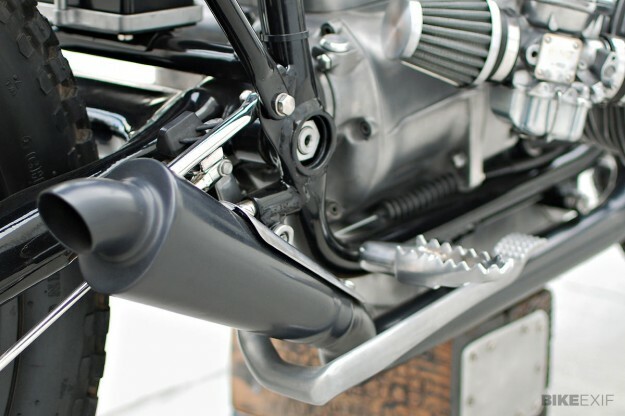 The shape of the modified rear sub frame came from a Ducati Monster seat that Kim had the shop. So he shortened and reshaped the seat loop, and made up an aluminum seat pan to fit it all together. 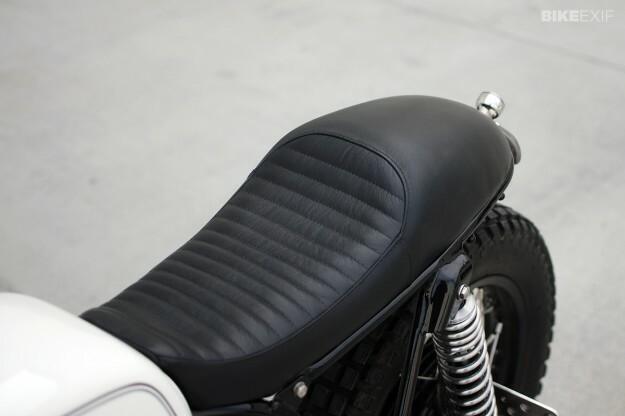 The seat was refinished by Haifley Brothers and it’s a perfect match. 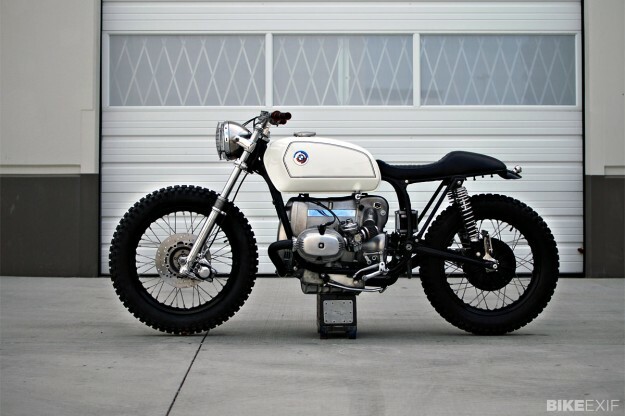 Like all BCM builds, this BMW is understated and classy. The BMX world’s loss is most definitely our gain. Images by Jose Gallina. Follow Kim Boyle’s adventures in custom building via the BCM website and Facebook page.